This could easily be an article about carbon, since transport accounts for approximately 20% of our carbon footprint, of which 70% is from cars, taxis and small vans. Moreover, this is an area which, if we use our resources wisely, we can reduce our dependency on petrol and diesel and stop fuelling the “need” for further exploration, whether that’s in the Arctic, or under our feet. However, it is predominantly a tale of inequality. By conforming to society’s view of the car as a status symbol, we inadvertently create a power struggle among road users, which is unhealthy at best, fatal at worst. And there are those among us who don’t have the choice, whether it’s age or financial constraints. We are creatures of habit and reaching for the car keys to “pop out” to get something is second nature, or typically for getting somewhere a bit more quickly. The benefits of getting out of this habit and deciding to walk or cycle more often are cumulative: better health and fitness, money saved on fuel; fewer cars on the road make it safer and it increases the reliability of journey times for those that have to be on the road. “Pour votre santé boujez plus”– as I heard on French radio this summer! Opting to leave the car at home also fosters a greater sense of community as even a wave and hello helps to make us feel connected. Crucially we could re-balance the hierarchy on our streets: it is the more vulnerable sections of society that need protection and thus should have priority in the space between our houses. No one likes to be stuck in a traffic jam: that is one instance where slowing down – imposed rather than our choice – increases stress. 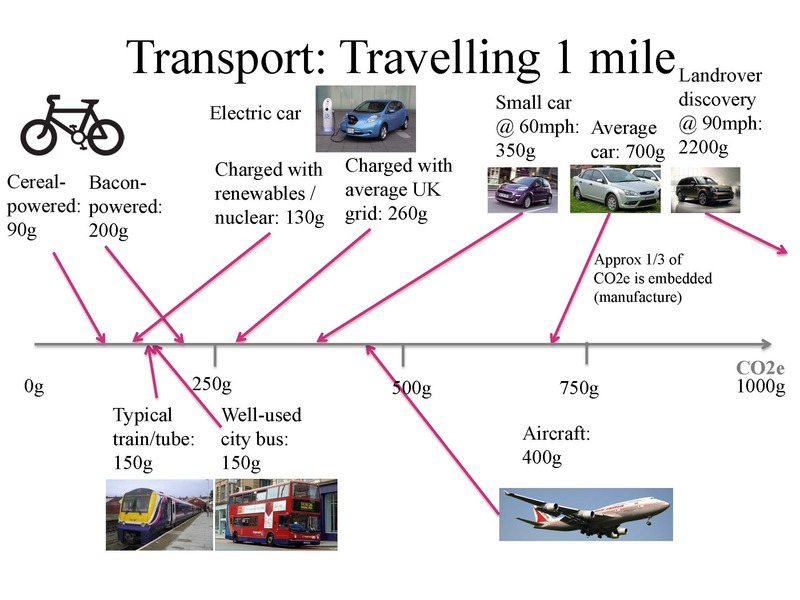 Why not switch to a low carbon mode of transport, such as walking, cycling or public transport, or a combination. If you can make it porridge powered rather than bacon, even better! Or if there really is no alternative, how about forming a car share group, even informally among colleagues, friends and neighbours. If you are driving, you could pledge to stick to under 20mph in town? Many towns have gone to 20mph speed limits where people live, because it dramatically reduces the likelihood of collisions, and if they do happen, then there is still a high chance of survival. The elderly and disabled are particularly vulnerable to this, leading to being trapped at home. Until they become formally implemented, there’s nothing like the present to adopt a smooth driving style and reduce our speeds, making it safer for all and improving fuel efficiency. You can read more on Sustrans’ website and on: http://www.20splentyforwilmslow.moonfruit.com. You can use the following to calculate your overall footprint, not least to compare different modes of transport for different trips. So, this month we challenge you to examine how many car trips you do in a typical month and decide to cut down the number of car journeys by 50% – it may mean different shopping choices, accessible on foot for example, or simply offering someone a lift and the favour returned at a later date. Doing so will be a definite move towards a more equal society, especially when it comes to sharing our streets. I hope you get to a place where you can genuinely enjoy your travels!